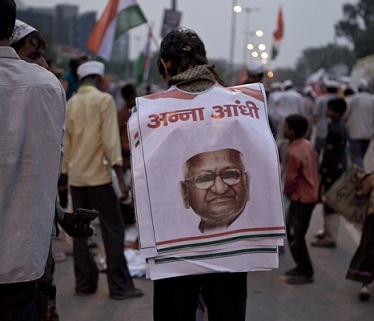 Anna Hazare was back in the news at the weekend. But this time, he wasn’t just agitating about the Lokpal Bill. Anti-corruption activist Anna Hazare is back in the news after staging a daylong fast on March 25 at New Delhi’s Jantar Mantar, the venue that first brought him to national prominence. This time the Lokpal (Ombudsman) Bill wasn’t the only issue on his agenda. Instead, Hazare was hoping to also bring attention to the case of murdered police officer Narendra Kumar, from Madhya Pradesh, and to voice support for a more effective protection program for whistleblowers. Kumar and 11 others are alleged to have been killed as a result of their anti-corruption work. First, he warned the United Progressive Alliance (UPA) government that it was courting mass arrests if so-called first information reports aren’t filed by August against 14 ministers who he claims are tainted by corruption. Second, he made a formal announcement over the integration of Team Anna and yoga guru Baba Ramdev, another source of headaches for the UPA government. Third, he set a 2014 deadline for the government to introduce a strong Lokpal Bill. Hazare’s announcement regarding Ramdev could be a cause for concern for the government. But his 2014 deadline on the Lokpal issue is actually something of a climb down for Team Anna, which should be a relief to the government as Hazare had previously been offering deadlines of weeks, rather than month.